The Principle of all the Pressure Measuring Devices is almost same in engineering, but for your convenient sake, you may divide it into following two types of Devices. It is the simplest form of Manometer, used for measuring moderate pressure. It consists of a tube, which opens at one end to the Atmosphere. In which, Liquid can rise freely without overflow. Hence the Height, to which the Liquid rises up in the Tube, gives the Pressure Head directly. 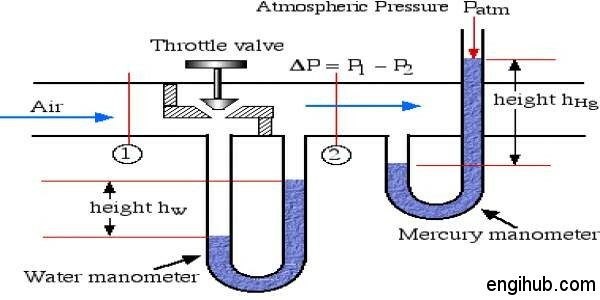 To find out the Pressure of a liquid flowing through a pipe, a Piezometer Tube is connected to the pipe. The important care to be taken that the Tube should not project inside the pipe beyond the surface, all the burrs and roughness near the hole must be removed and the edge of the hole should be rounded off. A Piezometer Tube is not suitable for measuring Negative Pressure because Air will enter the pipe through the Tube. It is the improved form of a Piezometer Tube. With the help of Manometer, you can measure, High Pressure and Negative Pressure also. It is the slightly improved form of Piezometer Tube for measuring High as well as Negative Pressure of Liquid. It consists a tube bent in U-shape. One end of which is attached to the Gauge point and another is open to the Atmosphere. Generally, Mercury which is 13.6 times heavier than Water is used as Liquid in Simple Manometer. Hence you can measure High Pressure also. You can also call it as the modified form of Manometer. In which cross-section area of Left Limb is 100 times larger than that of Right Limb. So, A Micromanometer is used for measuring Low Pressure, where accuracy is much more important. The Inclined Tube Micromanometer is more sensitive than that of Vertical Tube Micromanometer. It is the Device used for measuring the difference of Pressures, between two points in a pipe. It can also be used in two different pipes. A Differential Manometer, in its simplest form, consists of a U-tube, containing heavy liquid. Its two ends are connected to the points, whose difference of Pressure is required to be found out. It is a particular type of Differential Manometer, in which an inverted U-tube is used. Hence this is used for measuring the difference of Low Pressures, where accuracy is the prime consideration. It consists of an Inverted U-Tube. This contains a light Liquid whose two ends are connected to the point whose difference of Pressure is to be found out.